Martin Scorsese's "Hugo," a 3-D children's fantasy, led this year's Oscar race with 11 nominations, including Best Picture. 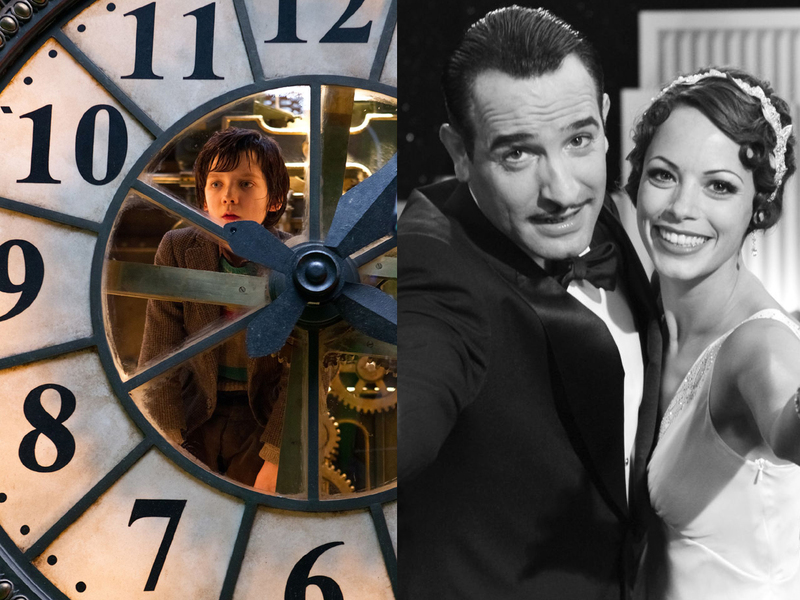 Just behind with 10 nominations is Best Picture nominee "The Artist," a silent comedy-drama that recreates Old Hollywood as it transitioned to talkies. There were nine Best Picture nominees in all this year, among them: "The Descendants," about a Hawaiian patriarch stumbling towards closure with both his dying wife and a land trust sale; "Extremely Loud & Incredibly Close," about a young boy trying to reconnect with his father who died in the 9/11 attacks; "The Help," based on Kathryn Stockett's bestseller about the divisions between African American maids and their White employers in 1960s Mississippi; and Woody Allen's comic ode to Paris of the 1920s, "Midnight in Paris." Also: "Moneyball," about how a new statistical analysis of ballplayers improved the prospects of the Oakland A's; Terrence Malick's family drama both personal and cosmic in scope, "The Tree of Life"; and the World War I epic "War Horse," adapted from the acclaimed play of a horse on the front lines of battle. Recent changes in the Academy's rules for Best Picture ballots - which use preferential voting to tally a particular film's support - mean that the number of first-place votes a particular film garners determines how many nominees there will be, between five and a maximum of 10. This year's slate means that "Bridesmaids," "Drive" "The Ides of March," "J. Edgar," "Melancholia," and "Tinker, Tailor, Soldier, Spy" failed to garner enough first place ballots to qualify. Joining Scorsese and "The Artist"'s Michel Hazanavicius in the Best Director category are Alexander Payne, "The Descendants"; Woody Allen, "Midnight in Paris"; and Terrence Malick for "The Tree of Life." Steven Spielberg ("War Horse") and Directors Guild nominee David Fincher ("The Girl With The Dragon Tattoo") were shut out, as were critics' favorites Nicholas Winding Refn ("Drive") and Lars von Trier ("Melancholia"). There were surprises in the acting categories, of both inclusion and omissions. Both of this year's Golden Globe winners - George Clooney (as a husband and absent father coming to terms with his dying wife's infidelity in "The Descendants"), and Jean Dujardin (as a prideful silent screen actor in "The Artist") - were nominated for Best Actor. Joining them were Demian Bichir as an illegal immigrant in California trying to make for his son "A Better Life"; Gary Oldman as a British agent brought out of retirement to sniff out a mole in MI6 in John le Carre's "Tinker, Tailor, Soldier, Spy"; and Brad Pitt as Billy Beane, the unorthodox general manager of the Oakland A's, in "Moneyball." Notably absent were Ryan Gosling ("The Ides of March," "Drive"); Leonardo di Caprio ("J. Edgar"); Michael Fassbender ("Shame"); and Michael Shannon ("Take Shelter"). The Best Actress category includes Glenn Close as a woman posing as a man in "Albert Nobbs"; Viola Davis as a housekeeper skirting the racial divisions of early 1960s Mississippi in "The Help"; Rooney Mara as computer hacker Lisbeth Salander in the adaptation of Stieg Larsson's "The Girl with the Dragon Tattoo"; Golden Globe winner Meryl Streep as British Prime Minister Margaret Thatcher - during and after her height of power - in "The Iron Lady"; and Golden Globe winner Michelle Williams as screen siren Marilyn Monroe in "My Week with Marilyn." In a particularly strong year, Kirsten Dunst of "Melancholia" and Tilda Swinton of "We Need to Talk About Kevin" were left out. Online campaigns by 20th Century Fox (headlined "The time is now") and by Twitter fans of actor Andy Serkis (#OscarForAndy) to win recognition of motion-capture as an acting exercise and not just a visual effects technique, do not appear to have won over the Academy's actors branch. Serkis, whose performances as Gollum in "The Lord of the Rings" trilogy and as "King Kong" helped revolutionize VFX, was ignored for a Best Supporting Actor nod for his portrayal of Caesar, the ape whose growing intelligence and self-awareness lead to his becoming a revolutionary leader, in "Rise of the Planet of the Apes." Among the nominees for Best Supporting Actor are Kenneth Branagh who played Laurence Olivier in "My Week With Marilyn"; Jonah Hill as a statistician who helps turn the Oakland A's into a winning team in "Moneyball"; Nick Nolte as a recovering alcoholic estranged from his sons in "Warrior"; Golden Globe-winner Christopher Plummer as an aging widower who comes out of the closet in "Beginners"; and Max von Sydow as the silent grandfather in "Extremely Loud & Incredibly Close." Out of the running: Albert Brooks as an organized crime figure with "dirty hands" in "Drive." The comic actor-director (previously nominated for "Broadcast News") quipped on Twitter: "And to the Academy: 'You don't like me. You really don't like me.'" Did Andy Serkis deserve an Oscar nomination? Oscar nominations: Who will take home gold? Best Supporting Actress nominees include: Berenice Bejo as the rising star of talking pictures in "The Artist"; Jessica Chastain as an outcast from Jackson's racist white community in "The Help"; Melissa McCarthy as one of the less demure of the "Bridesmaids"; Janet McTeer as the companion of "Albert Nobbs"; and Golden Globe winner Octavia Spencer as the housekeeper of a racist boss in "The Help." Not nominated were rich performances from Shailene Woodley as the wise teenage daughter of George Clooney's cuckolded husband, and Judy Greer as the unsuspecting wife of the Other Man, in "The Descendants"; Elle Fanning as a precious young actress in "Super 8"; Keira Knightley as a psychoanalytic patient in "A Dangerous Method"; Carey Mulligan in both "Drive" and "Shame"; and Vanessa Redgrave in "Coriolanus." In a year with many animation releases but seemingly fewer stand-out titles, changes in Academy rules assured five nominees, yet many big names were left out: Steven Spielberg and Peter Jackson's "The Adventures of Tintin" was shunned, and Pixar's "Cars 2" did not make the last lap, though Johnny Depp's lizard in "Rango" made the final five. Also nominated: "A Cat in Paris"; "Chico & Rita"; "Kung Fu Panda 2"; and "Puss in Boots." Leading the race for the Best Foreign Film is Asghar Farhadi's Golden Globe-winner "A Separation" (left), from Iran, about a marital dispute that spirals downwards as it works its way through the Iranian justice system. Also nominated: the Belgian crime drama "Bullhead"; "Monsieur Lazhar" (Canada), about an Arab immigrant who becomes a teacher; "Footnote" (Israel), about the conflict between a father and son who both teach in the Hebrew University's Talmud department; and "In Darkness" (Poland), a true story directed by Agnieszka Holland ("Europa, Europa") about Jews hiding from the Nazis in a Polish ghetto. In addition to their directing nominations, Woody Allen and Michel Hazanavicius were nominated for Best Original Screenplay (along with Annie Mumolo & Kristen Wiig for "Bridesmaids"; J.C. Chandor for "Margin Call"; and Asghar Farhadi for "A Separation"). In the Adaptation category "Descendants" director Payne shared a screenplay nomination, while his star, George Clooney, shared a nomination for his script of "The Ides of March." They are up against "Hugo," "Moneyball" and "Tinker, Tailor, Soldier, Spy." With two nominations for Best Original Score - for "The Adventures of Tintin" and "War Horse" - John Williams has now received the most Academy Award nominations ever (except for Walt Disney), with 49. Also nominated for Best Score are "The Artist," "Hugo" and "Tinker, Tailor, Soldier, Spy." But it's a thin year for Best Original Song nominees, with only two: "Man or Muppet" (from "The Muppets"), and "Real in Rio" (from "Rio"). "Hugo," "The Artist," "War Horse" and "The Girl With the Dragon Tattoo" all made strong showings in the below-the-line categories. Perhaps the strongest category for nominees is Best Cinematography, with "The Tree of Life" (left), which has taken every critics prize. It is competing against "The Artist," "The Girl with the Dragon Tattoo," "Hugo" and "War Horse." But good ol' film stock still wins out among the Cinematography Branch: Only "Dragon Tattoo" and "Hugo" were shot exclusively with a digital camera. Leading the Best Editing category: "Dragon Tattoo," which faces stuff competition from "Hugo," "The Artist," "The Descendants" and "Moneyball." "The Tree of Life" failed to make the final five among the Visual Effects nominees, which - in addition to "Deathly Hallows" - include "Hugo," "Real Steel," "Rise of the Planet of the Apes," and "Transformers: Dark of the Moon." The past is again present in the Best Costume Design category, from an England Elizabethan ("Anonymous"), Edwardian ("W.E. "), and Romantic ("Jane Eyre"), to 1920s Paris ("Hugo") and Hollywood ("The Artist"). The nominated feature documentaries told stories of war, justice, fights over the environment, and high school athletics, as well as the artistry of dance. Nominated were Joe Berlinger and Bruce Sinofsky's "Paradise Lost 3: Purgatory" covers the latest developments in the West Memphis 3 case, including their release from prison last summer; "Hell and Back Again," embedded journalist Danfung Dennis' document of a Marine company in Afghanistan (which won the Grand Jury and cinematography prizes at Sundance); "If a Tree Falls: A Story of the Earth Liberation Front," a look at the radical movement; Wim Wender's "Pina," a 3-D dance performance film honoring the late choreographer Pina Bausch; and "Undefeated," a coming-of-age story of high school football players. How did guilds do as Oscar predictors? Three Producers Guild nominees - "Bridesmaids," "The Girl with the Dragon Tattoo," and "The Ides of March" - failed to get Best Picture Oscar nominations. Directors Guild nominee David Fincher was left out, in favor of Terrence Malick. The Screen Actors Guild was close to the final lineups, with just three of the SAG's 20 acting picks - Leonardo di Caprio, Tilda Swinton, and Armie Hammer, from "J. Edgar" - missing from today's Oscar lineup. The American Society of Cinematographers' nominations included "Tinker, Tailor, Soldier, Spy," while the Academy favored "War Horse." The Art Directors Guild and Costume Designers Guild each award honors in three categories - period, fantasy, contemporary - and so each has nominated 15 films. Yet the Art Directors Guild did NOT choose Oscar nominees "Midnight in Paris" or "War Horse," and the costumers did not go for Oscar nominee "Anonymous." The Visual Effects Society has nominated "Captain America: The First Avenger" and "Pirates of the Caribbean: On Stranger Tides" - both missing from the Oscar lineup. The best predictor was the American Cinema Editors guild. All five of the Best Editing Oscar nominees were also cited by the guild - but that group actually chose seven nominees, with "Midnight in Paris," and "Young Adult" filling out their list. The 84th Academy Awards ceremony will be presented on Sunday, February 26, 2012, at the Kodak Theatre at Hollywood & Highland Center, hosted by Billy Crystal.